KR+H was pleased to provide the millwork for this project with Hacin + Associates and F. H. Perry Builder. 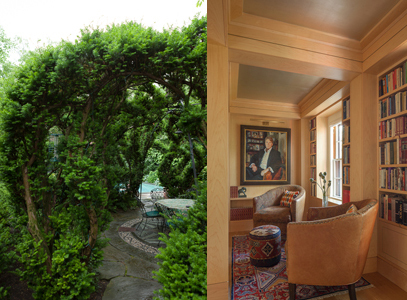 Along with images showing KR+H's work in the home's library, we thought you would like to see both an exterior view of the addition along with a look into the garden. David Hacin shared with us a brief description of the project: "In building an addition to this historically significant Cambridge home, H+A sought to introduce contemporary design to a composition of building masses that each reflected the needs and style of their time. The new master suite connects directly to the main early 19th century volume of the house at the second floor and sits above a music room that was separately moved and added to the house (at a later date) from its original location, currently the site of the Fogg Art Museum. New elements, such as the millwork, drew inspiration from the original home and act as a bridge connecting all parts of the house and their respective characteristics." - David Hacin, Hacin+Associates. All photographs by Michael Stavaridis.